I woke up this weekend to the crisp Tennessee fall air and was so happy. I love waking up to that chill, there is a freshness in the smell of the air. Fall is my favorite time of year because it is so pleasant and cozy. Nothing is better than a cloudless sky and fall weather in Middle Tennessee. I love to watch the leaves flutter down. I don't have much in the way of fall decor for our new house, so I am looking around for ideas that will carry me through Thanksgiving. I do want to add in a little bit of Halloween mystery in October (more on that soon!) but I don't want to completely transition decorations when November rolls around and it is time for Thanksgiving. 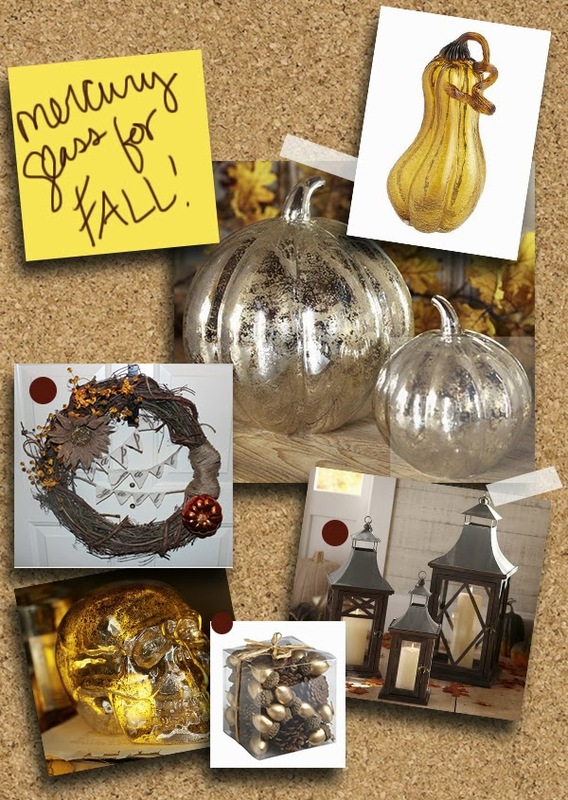 Mercury glass is one of my favorite things to decorate with, so I thought, why not skip the kitschy orange pumpkins and faux leaves and be a little more sophisticated? Here is my pinboard of inspiration. I drooled at Pottery Barn's window this weekend at the mall (the husband was with me and he was pulling me away) so of course now I can't get the beautiful ivory, black and glass items out of my head. Since I already have touches of orange and mercury glass in my living room, this look is ideal for me.